Woody Allen walked Elihu Blotnick to school, for $1 a week, once upon a time. The story is true. Later, Blotnick spent time in jail for his briefly banned narrative, “Confessions of a Plastic Man”. 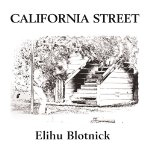 Both stories can be heard on California Street 1, the collected early works of Elihu Blotnick, read by the author, available for download or as a four CD audio release. The eleven stories included, called "fascinating and frightening" by the Pacific Historian, when they first appeared in book form under the same title in 1981, belong in the category of “short story journalism and narrative non-fiction”; these are seminal stories, each resonant with a new character voice: from the beginning of electronic games, during a surge of alien claims on the U.S., at the advent of credit cards, and when fountain pens, the flag, and Woody Allen were fashionable. If re-told now, the details in some stories might change, but not the essence and outline or the personalities. The stories were published in Scanlan's and San Francisco Magazine, written on assignment for Rolling Stone and Life, and pulled from his desk drawer. Blotnick is better known as a photographer; the original book contains many of his images. Since the loss of an eye however, he has shifted his focus to writing, and, in reviewing his past, rediscovered the recordings, made at his Little Known of Gallery, in San Francisco then, but a virtual site now. Firefallmedia has remastered and rerecorded parts of the tapes for the current release. Narrative non-fiction and short-story journalism of Elihu Blotnick. A miscellany, the third in the series by Elihu Blotnick, exploring the nature of art and identity, this time between 1979 and the present. Included are six experimental short stories in varied voices, and sixteen essays on subjects as diverse as blindness, communicating with aliens, art, artists, art-gangs, visual languages, being a Una-bomber suspect, comix, and the evolution of the counter-culture. The 51 black and white photographs serve as illustrations and stand alone photo-essays. A personal journey through a varied and evolving world by an imagist who helped create the cult of the counter-culture. 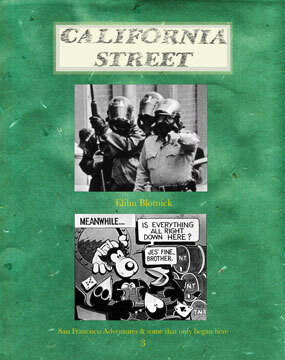 Elihu Blotnick is also the author of Saltwater Flats (BBM Associates 1975), reviewed by the New York Times as “powerful and very personal images of contemporary America”.